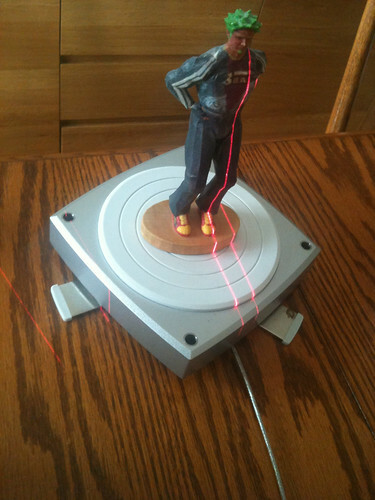 I have borrowed a NextEngine 3d scanner for the Cool Stuff Collective shoot on friday. It belongs to a professional movie animator and puppeteer Craig Crane who lives very near to here. It was amazing to see all his home setup kit and hear about the work he does with larger scanners scanning in entire film set locations and them meshing them up for CGI special effects. He has a personal project too here. The scanner software is windows only and it seemed safer to bootcamp my Mac Book Pro just to make sure I got the performance. I have VMware and Parallels, bit good but when hardware and intensive gfx are needed direct windows seems better. The models are very detailed even on the low res scan. I had some success with the texturing too. It takes 2d photos and then maps them on the object. A very impressive piece of kit, I am not sure I can justify buying it for myself, though with the new mesh support arriving in Second Life and the ability to drop these meshes into Unity3d (with a bit of decimation first) it would be a very useful tool.